Mario Kart has often been called ‘the destroyer of friendships’ due to certain imbalances or simply the fact you can get fucked over the last few seconds of a race. If the overall concept of animals, plumbers and imaginary beasts throwing bananas, shells and other items at one another wasn’t already wacky enough, how about we toss in some old farts and nags and their mobility scooters in a flashy world, all while the grim reaper is chasing them? Well, wait no longer, you can try to cheat death by outrunning and gunning the reaper himself. It was quite unexpected to find a Story mode in Coffin Dodgers and truth be told, as flimsy as the story may be, it’s fun to see that the developers implemented a fun, yet simple story to go with what’s occurring in Sunny Pines, the local storage for old geezers and wrinkly ladies. It seems that the grim reaper is quite a busy bee as he visited the seven elderly inhabitants of Sunny Pines to tell them they will be dead in a matter of days. The old coots then decide it’s not their time to go yet (forever young) and come up with a proposal, namely race to the death on their mobility scooters. The grim reaper loves a challenge and thinks these old shriveled human beings will not put up much of a fight anyway and thus agrees. Boy, he was wrong. The developers added a second playthrough for the grim reaper himself, and while the texts and such during the races have not been adapted to this new setting, the end scene has, which makes it quite fun to play the game a second time around. It must have been better back in the day indeed as the developers seemingly chose to opt for polished PlayStation 2 graphics. While the game doesn’t really look bad, it could have used a few more finishing touches in order to make it ‘next-gen’. That being said, you’ll be treated to a very colorful world, with some clutter and background material, but all in all, Sunny Pines is a rather desolate place, if you don’t count zombies roaming the street, and that single police car always chasing the same car. The main issue is pretty much that everything is just flat. It’s all flat roads, an obstacle here and there but simply with different textures pasted on. It’s quite bland and boring if you’re driving over train tracks and such but notice nothing different as it doesn’t even pop out from the road itself. 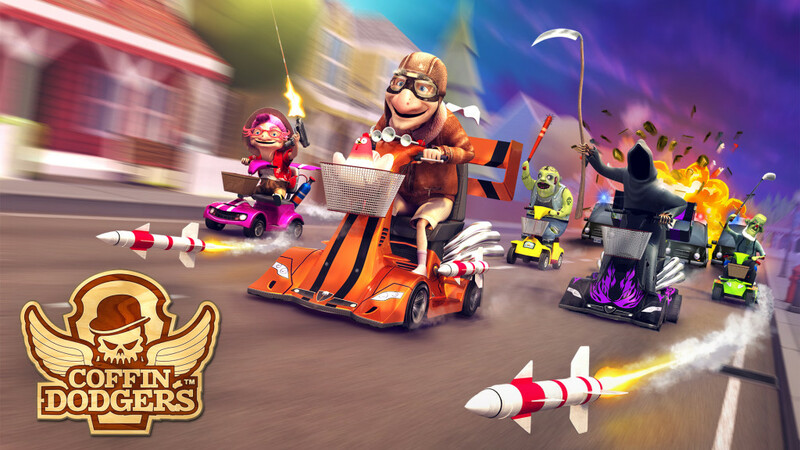 Coffin Dodgers’ soundtrack is equally amusing, and gets you riled up for the races to come, as it is annoying because it keeps looping way too quickly. 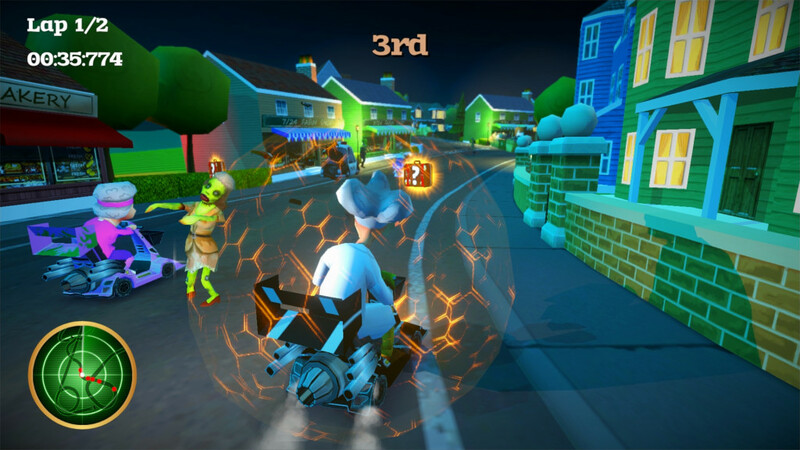 The hyperactive tunes of the game are ideal to get you in the mood for a violence packed mobility scooter race, but if you have to retry certain levels, the music tends to get on your nerves. Sadly, even though there are only eight characters, the developers didn’t do an effort to add some voice acting to the cast. You’ll only get some standard SFX to go with the music, and that’s pretty much all you’ll have to make do with. As far as kart racers go, it is no secret the last installment of the Mario Kart franchise was molded and polished into the best title in the genre currently available. While it’s hard to compete with such a competitor, we hoped the quirkiness of Coffin Dodgers would make up for a lack in mechanics and feeling, but in the end the game did not reach half the quality of Nintendo’s top racing title, but it felt a bit more like we went back to the Dreamcast to play Walt Disney World Quest: Magical Racing Tour, which was probably one of the most horrible kart racing games ever made, when it came to how racing actually worked. Luckily, Coffin Dodgers does have some fun aspects to offer. The game does offer a set of different modes such as the Story, Quick Race, Time Trial and Explore modes. The story is pretty much the equivalent of the Championship mode in other games, while the Quick Race and Time Trial modes are self explanatory and are all about driving one track just for the fun of it, with or without resistance. The Explore mode allows you to roam freely throughout the entire ‘world’, and if you’re up for it, you’ll be able to start a track when you pass a portal to do so. Other than that, the modes are pretty simple to get into. 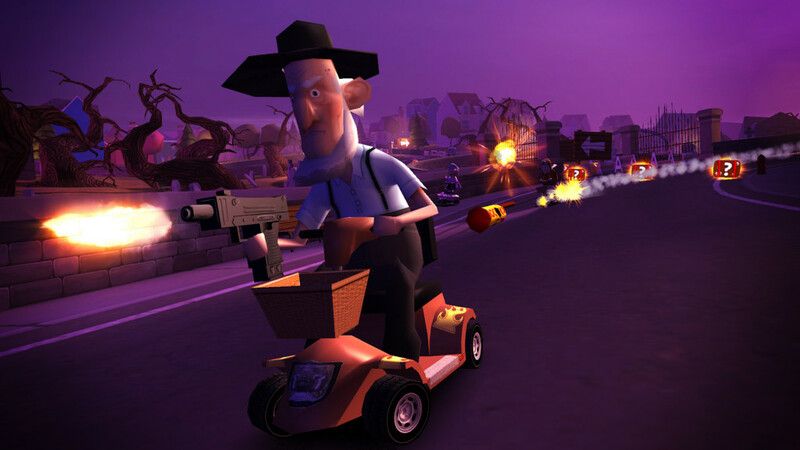 If you’re truly up for something random, you can try the Crazy Granddad option, in which you simply drive around town, collecting items, for no real reason, except to gain new high scores. As expected for a title such as this, the mechanics proved) prove to be rather simplistic, as you’ll be treated to arcade-like racing with weapon pickups scattered all around the different tracks. While the different power-ups are quite slim in numbers, they do the trick and there is no real need to add more. A fun addition is that all of the old people can hit other drives with their canes, a bit like the elderly version of Road Rash. This adds a bit more fun to the party of the nearly deceased, but the rest of the mechanics is a bit lacking. There is no learning curve, as drifting or other techniques are simply non-existent in this game. While this makes the game extremely easy to learn and master, it doesn’t grant you anything to look forward to anymore. 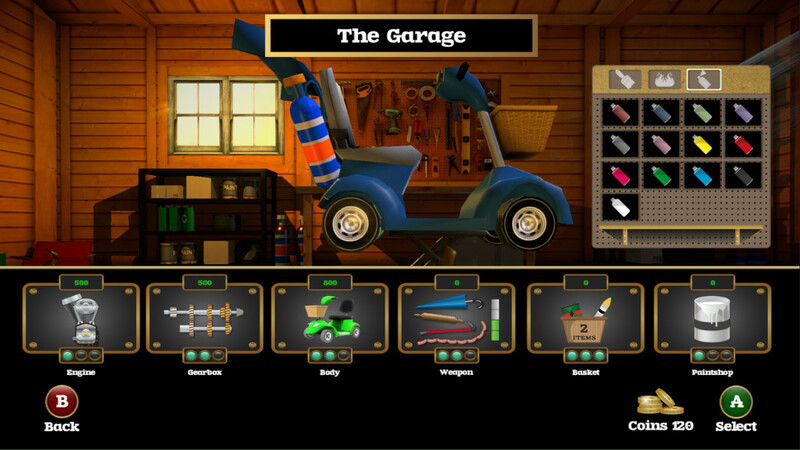 What Coffin Dodgers throws into the mix and what is actual original and fun is the garage. You’ll be able to (slightly) pimp your mobility scooter to become the next racing sensation. The game allows you to upgrade parts to increase your traction, top speed and acceleration. It also helps you out to tweak some of the power-ups and weapons you find on the map and there are a few color options to give you a sense of customization. Overall this area has not been fully fleshed out, but it adds a fun quirk to this title. That being said, to start pimping your ride, you’ll need the money you earn in the Story mode. You’ll not only get money, but also experience and honest to God, we have no clue what the experience actually gets you. We reckon it’s simply a status symbol to show your friends you shamefully played hours and hours of this game. Even though the developers added split-screen functionality (yay) they ignored another key multiplayer component, namely online play (boo). While this game is heaps of fun with friends, it’s a missed opportunity to ditch online play all together and aim for a couch co-op title. It could have done the game a lot of good if there was an actual competitive community with rankings and such. Overall the game does have a bit of content to offer, but it feels quite lacking as there are only around thirteen tracks to explore. While this could be sufficient if the tracks were quite lengthy, seeing you can finish most in three minutes or less, you’ll plow through the content rather quickly, only trying to get money to upgrade your badass grandpa cart. This also means that when you screw up during the last lap of a race, it’s highly unlikely you’ll be able to come back on top. Random bugs did occur in this early release build, such as speed boosts actually slowing you down or a random bug that made you bounce all over the track, making you lose control until all of the other participants reach the finish line. Hopefully small issues that will get patched in the near future. Even though the tone of this review has been rather negative, Coffin Dodgers does have some plus sides which make the game a rather fun mess. While you’ll plow through the content in hardly any time and the mechanics need a lot more polishing, the game has its bright sides when playing with friends or simply due to its theme. If you’re into these things you’ll probably have some fun with it, if not, it’s best to keep this one in the retirement home until it’s six feet under.